Maybe it makes sense that the path to the Olympics from the decidedly temperate, Mid-Atlantic locale of Vienna, Va., in the decidedly frigid sport of ice hockey wasn’t a straight line. Maybe it makes sense that for Garrett Roe to become a center on the U.S. Olympic hockey team that his meandering road had to be from the Washington suburbs to Minnesota to Indiana back to Minnesota to Upstate New York to Austria and Germany, Sweden and, currently, Switzerland. “I really think it’s mind-blowing,” said Garrett’s father, Larry, an integral figure in the development of youth hockey in suburban Washington. Garrett Roe isn’t an NHL player, and the NHL is sitting out the Olympics for the first time since 1994. But to be clear, Garrett Roe has devoted his life to hockey, and his status as a journeyman pro in Europe doesn’t mean he’s not a deserving Olympian. He will turn 30 before the Games are over. Most American hockey fans will see him play for the first time at the upcoming PyeongChang Games. And yet . . .
Roe said this by phone from the apartment he shares with his wife — also a Vienna native — in Zug, Switzerland, a town of roughly 30,000 people less than 25 miles south of Zurich . There, he is in his first season playing for EV Zug, for whom he has recorded 34 assists and 45 points in 39 games, numbers that place him second and fourth, respectively, in Switzerland’s National League. Roe is in Europe both by choice and by necessity. His first season with Zug follows an initial foray with Salzburg, Austria, in 2013-14, then a season with Munich in the German league, then two years with Linkoping in southern Sweden. These could seem like hockey outposts, physically thousands of miles from the NHL, seemingly even further from the spotlight. But when the world’s best league couldn’t reach a deal to return its players to the Olympics, national federations had to turn to every corner of the globe where their countrymen were playing to field teams for South Korea. And in Zug, USA Hockey found a talented forward drinking in the world. That, too, could be said about the entirety of Roe’s career. He has learned things he wouldn’t learn somewhere else. When Garrett was growing up as the youngest of three boys in Vienna, he had a typical athletic mentorship. His older brothers both played hockey. His father took up coaching. He followed them to the rink. That he grew hooked isn’t all that surprising. That he was talented perhaps was. Gendron is now the coach at the University of Maine, but back then he ran hockey camps. Larry Roe had helped found the Reston Raiders hockey program back when rinks were hard to come by in suburban Washington. Fairfax County isn’t exactly Toronto or Boston. The ponds don’t freeze regularly enough. Hockey can be a tough ask. But when Roe and others helped start the Raiders in 1993, they found a latent yearning for hockey. The first day of registration, 100 kids signed up. By the second or third year, parents were sleeping out on a Friday night in July so they could be assured of one of the limited spots in the growing club when sign-ups opened Saturday morning. This environment, it produced an Olympian — but not on its own. As Garrett grew, he also became an exceptional soccer player, one gifted enough that he was in a national pool of 30 players for U.S. Soccer’s under-15 team. All this athletic potential was coming to a head. His passion, then, took him to a place not typical for kids who go to Wolftrap Elementary and Kilmer Middle School. He went to Shattuck-St. Mary’s School in Faribault, Minn.
“I absolutely fell in love with the place,” Roe said. For an aspiring hockey player, what’s not to like? One of his classmates was Kyle Okposo, a forward who’s now in his 11th year in the NHL. On the prep team, just ahead of Roe, was none other than Sidney Crosby. Jonathan Toews, a future Chicago Blackhawks star, arrived the following year. The father of 13-year NHL veteran Zach Parise helped with Roe’s transition. And yet he left early. Back then, Gendron — who had gotten to know the Roes through youth hockey and the USA Hockey system — had taken over a junior franchise in Indianapolis, the Indiana Ice of the U.S. Hockey League . And he wanted Garrett Roe to play for him, even though in his first season of 2004-05, Roe was only 16, and the USHL allows players as old as 20. So Roe was off on his hockey path. At St. 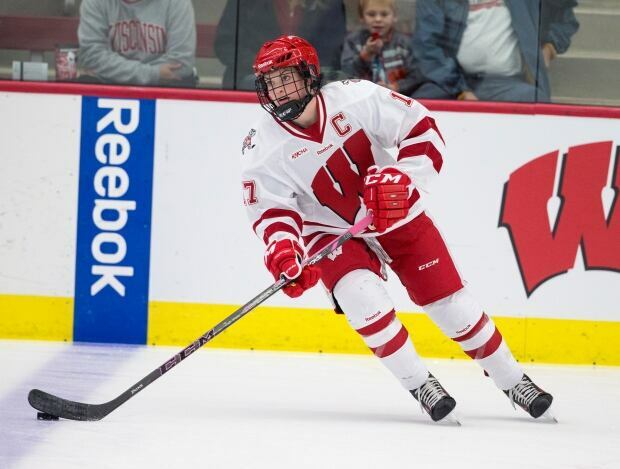 Cloud State back in Minnesota, he played in the formidable Western Collegiate Hockey Association and became the school’s all-time leader in assists . He broke into the professional ranks as a member of the Philadelphia Flyers organization, playing for the Adirondack Phantoms in the American Hockey League, one step from the NHL. And then came something of a crossroads: As Roe headed into his second season in Adirondack, the NHL prepared to lock out its players in a labor dispute. The Flyers, like most clubs, sent many of their prospects who straddled the AHL and NHL levels back to the minors. Roe, slated to be the top-line center, was bumped back in the lineup. When the lockout ended in January, Roe moved back up. But then he hurt his shoulder. All around, the year was kind of lousy, and he became a bit disillusioned. “It left a bad taste in my mouth,” Roe said. The following summer came the offer to play in Austria. Even though some NHL clubs said they were interested, this was guaranteed money. “A bird in hand,” Larry Roe said. So Garrett jumped across the Atlantic. Five years later, he thinks about it still. “I always tell people: I don’t regret it, because I’m happy with how things have gone in my life,” Roe said. “But at the same time, if I could do it over again, I’d probably try to take another shot at it at home. I’m a big believer in betting on yourself and believing in yourself. In that case, I don’t think I bet on myself. That path has now led somewhere new. In the week after Christmas, Roe received a voice mail from Jim Johannson, the general manager of USA Hockey who died unexpectedly Jan. 21. Johannson’s message was simple and calm: Call me. When they spoke, the message was equally simple and calm: Congratulations on becoming an Olympian. Now let’s go to work. So the kid who used to drive around the Beltway to Capital Centre to watch Peter Bondra and his Capitals go to work, the one who now lists Caps center Nicklas Backstrom as his favorite NHL player — now he will go to South Korea to try to win a gold for his country. What a path. There’s a new fever spreading over the town of Stellarton. Let’s call it the Blayre Turnbull syndrome. The Nova Scotia town of 4,200 is firmly behind their new Olympic idol. 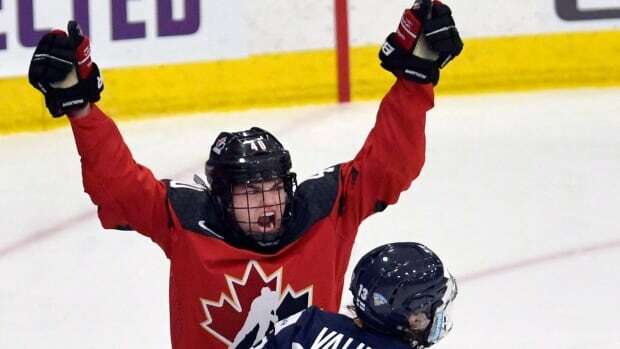 Turnbull and Jillian Saulnier of Halifax have become the first two Nova Scotians to be named to the Canadian Olympic women’s hockey team. Turnbull, who plays forward, and her teammates flew to South Korea last week to go through their final preparations for the Games. Meanwhile, back at her old elementary school in Stellarton, students and staff have been working on a video they will be sending to their now famous alumnus. In minor hockey, Turnbull skated on boys teams. Every other year she would play on the same team as her younger brother Brent, now a forward with the St. Francis Xavier University hockey team. There are many girls’ hockey teams in Nova Scotia, and many of the players idolize Turnbull and Saulnier. The Fundy Highland Pee Wee Selects got to meet Turnbull when they played in a tournament in Calgary hosted by Canadian hockey legend Hayley Wickenheiser. Turnbull stood with the team for a picture she later posted on her Instagram account. When she was the same age as those girls it was becoming obvious she had a lot of talent and potential. Throw in a lot of desire, too. Her father had coached her on most of her minor hockey teams and as a family they decided she would go away to a prep school in Faribault, Minn.
That school, Shattuck-St. Mary’s, is best known for producing two NHL stars from Nova Scotia, Sidney Crosby and Nathan MacKinnon. Turnbull attended the school at the same time as MacKinnon and won two national championships in her two years with the team. That paved the way for a full athletic scholarship to the University of Wisconsin, where she had four outstanding seasons. Suddenly, she was on the radar of Hockey Canada. On the ice Turnbull was finding success at every level. But off the ice she had some very tough things to deal with. When she was 13 her parents split up and when she was 15 her mother, Margie, died of cancer. It was less than a year later that she left Nova Scotia to go to school in Minnesota. Blayre Turnbull hopes to win a gold medal in South Korea in her mother’s memory. Her best friend is USA goalie Alex Rigsby. They bonded when they played together at Wisconsin. Turnbull is helping Rigsby deal with her own mother’s fight against cancer. In two weeks, those two best friends could be on the ice battling against each other for a gold medal. 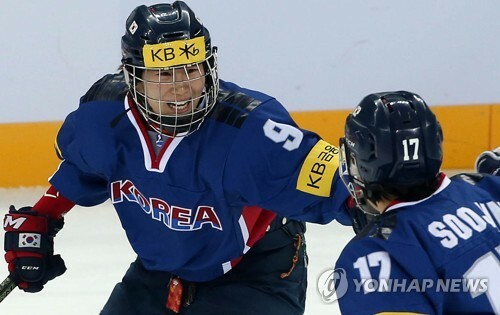 On the South Korean women’s ice hockey team, players say forward Park Jong-ah plays a game with which they are not familiar, such is the level of her skills. And South Korea, ranked 22nd, will need every bit of her scoring touch at the PyeongChang Winter Olympics, where it will face three top-10 nations: No. 5 Sweden, No. 6 Switzerland and No. 9 Japan. The 21-year-old has been an instrumental figure in South Korea’s improbable transformation from a perennial doormat to an emerging force. No one has scored more momentous goals for South Korea over the past year than Park. It was Park who netted the game winner in the thrilling, 3-2 shoot-out victory over China at last year’s Asian Winter Games in Sapporo, Japan. China had defeated South Korea 10-0 and 20-0 at two previous Asian Winter Games, and Park finally put South Korea over the top with her goal. During regulation, Park had scored an equalizer that made it 1-1. South Korea fell just short of a bronze medal in Sapporo, but it was still the country’s best finish at the regional competition. In April last year, at the International Ice Hockey Federation (IIHF) Women’s World Championship Division II Group A tournament, Park put South Korea on her back and carried the team to the title with a 5-0 record. It earned South Korea a spot in the next level of the IIHF championship, Division I Group B, for 2018. South Korea scored 21 goals, and Park had her hand on 10 of them, with four goals and six assists. With those 10 points, Park ranked first on her team and second in the tournament. Last July, South Korea hosted world No. 5 Sweden for two friendly matches. South Korea lost both games, by 3-0 and then by 4-1, and it was none other than Park who netted the team’s lone goal, on a third-period breakaway. Suffice it to say, South Korea’s offense will only go as far as Park carries it. At 21, Park is far from a seasoned veteran herself, but will likely play alongside a pair of highly-promising teenagers on the team’s top line — a 16-year-old winger Kim Hee-won and a 17-year-old center Grace Lee. Park and the rest of her team ran into an unexpected hurdle before the Olympics, with the formation of a joint Korean team, with 12 North Koreans having been added to the 23-player South Korean roster. Of those 35 players, only 22 can dress for games during the Olympics — 20 skaters and two goaltenders — and at least three North Koreans must be inserted into the lineup. The two squads have been practicing together since the start of this week, and it’s not clear which three North Koreans will emerge come the Olympics. But one thing is clear: Park is in no danger of losing her spot and she’ll be counted on for significant offensive production.